Background. 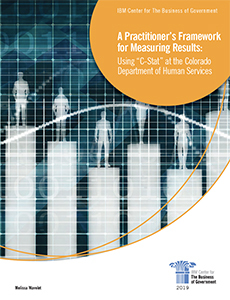 Meeting and sustaining a high level of performance was the challenge facing Colorado’s Department of Human Services (CDHS) when Reggie Bicha was appointed by the governor to lead it in 2011. The department was under a 2008 court order to improve the processing of new food and cash assistance applications to vulnerable citizens “in a timely manner 95 percent of the time for at least 12 consecutive months” in order to meet the terms of the settlement agreement. At that point, only about 40 percent of applications were processed in a timely manner. Meeting the goal of 95 percent could be achieved via a concerted campaign, but this was only a small subset of the 25 human service programs run by the department, and campaign would not assure meeting that target consistently and indefinitely. Bicha decided to use a broader performance leadership strategy to tackle this and other persistent performance problems facing the department, and this included influencing how each of the 64 counties, and state contractors, managed their portions of these programs, as well. She says C-Stat routines changed how top and mid-level managers managed, and how county officials and contractors did their work. Leaders Drive Change. The routines created by C-Stat incentivize CDHS leaders to focus on the use of data and learning strategies. This ultimately helped top, mid-level, and front-line managers to be more strategic, problem-solving, and focus on measuring the outcomes and outputs that define success. The department’s executive leadership team began to approach performance anomalies with a greater sense of urgency, since C-Stat expected them to report back to their peers on progress in 2 to 4 weeks. They rarely accepted “I don’t know” or “I can’t tell,” as acceptable answers. They became relentless in collecting and analyzing data to diagnose and solve problems. Likewise, mid-level and front-line managers responded. Wavelet said they quickly understood “C-Stat is not an administrative function to comply with in addition to the ‘real work.’ C-Stat is about the real work.” These managers began to carefully select the measures used for their C-Stat reviews, with an emphasis on metrics that incentivized achieving the desired outcomes. They also spent time with their staffs preparing for potential questions that would likely be raised in C-Stat sessions. After some degree of reluctance, counties became avid consumers of their own performance data and began using it to monitor their own performance. This increase use was enabled by the creation of monthly C-Stat reports and subsequently, an on-line Dashboard. These one-stop portals combined data from nine separate systems and made it easier to analyze. Results. As a result of employing the C-Stat framework, the statewide performance for processing food and cash assistance applications exceeded the court-mandated 95 percent goal for the first time in April 2016. This goal was maintained in the months that followed. As a result, the terms of the court settlement agreement were finally reached – nearly ten years after they were imposed. Sustaining the goal continues to be a challenge, but by incorporating these measures into the ongoing C-Stat process, the level of attention and ability to quickly correct deviations is in place. This framework led to improved performance in other programs as well. For example, CDHS virtually eliminated the use of seclusion for mental health patients; it doubled the number of children receiving child care subsidies; and it nearly doubled the number of timely monthly contacts for at-risk adults. What’s Next? Bicha left Colorado state government at the end of the governor’s term in early 2019. The biggest challenge of every performance management system is – will it survive the transition to a new leader? In the case of C-Stat, the new governor, Jared Polis, has signaled his support for the C-Stat approach, and possibly extending it statewide. His new director of operations and cabinet affairs, Tony Gherardini, previously oversaw CDHS’s C-Stat framework.